The market for electric vehicles (EVs) is growing and is expected to reach 3.8 million by 2020. Tesla and other players are expanding the production of electric vehicles to meet the rising demand. EV models are becoming more affordable as a result, which in turn fuels the adoption even further. The charging infrastructure has been growing along, often supported by local governments. But how will the shift to electric vehicles impact the grid? Are the utilities prepared to accommodate this extra load? What will happen to peak demand? And can the grid benefit from wider electric cars deployment? In the United States, Canada and other Countries leading in electric vehicle adoption, the current grid capacity is not an obstacle that could slow down or hamper technology take-up. It is at the local level, so-called ‘the last mile’, that the problem occurs: the local distribution grid may not be sufficient in cities and neighborhoods where electric cars are particularly prevalent. Some local distribution grids are simply not built to accommodate the huge spikes in power demand. An example is Colorado, where the number of electric vehicles has jumped by 150% since 2011, Silicon Valley is another hotspot. Typically, an electric vehicle with a daily commuting distance of 40km requires 6-8kWh of energy to recharge, which is roughly equal to the daily power needs of a small household. In other words, introducing an electric vehicle to a neighborhood is roughly the same as adding another house. Power transformers, which connect every home and business to the grid, are the most vulnerable and affected elements of the system. Most residential transformers are designed to serve between 10 and 50kVA of load, while a single plug-in vehicle (PEV) with a 240V Level 2 charging system consumes about 7kVa. If multiple electric car owners use the same distribution transformer (such situation is referred to as clustering), they may cause damage or outages from overloading the equipment or by shortening their normal cool-down period. A single overloaded transformer can, in turn, degrade power quality in other residential feeders. To make things worse, transformers do not contain any telemetry systems built in to send information on their health to utilities. In many cases, power companies do not have any system in place informing when the overload occurs. How serious is the problem? Some studies suggest that higher penetration rate of electric vehicles increase transformers’ loss-of-life factor, even by up to 10,000 times. And this comes with a hefty price tag. The Sacramento Municipality Utility District, for example, has recognized that about 17% of the company’s transformers may need to be replaced as a result of EV-related overloads, at an average estimated cost of $7,400 per transformer. The risk of overloading local transformers is particularly high during peak hours. Imagine what will happen when all-electric vehicles owners in the neighborhood decide to recharge them at the same time, in the early evening, after returning from work, which is more or less the same time households turn their cooking, cooling and other appliances on. And this is not just a theoretical problem. The study conducted on electric cars users in Austin, Texas has confirmed this exact pattern. The most severe impacts of charging when arriving home occur in June, July, August, and September. Local transformers may not be able to withstand such extra pressure. Can such situations be prevented? Of course, utilities can modify customers’ demand using price. Why not offer car owners discounted rates for charging their vehicles during the night? It looks like a win-win situation; the car battery will be fully charged by the morning without the detrimental impact on the grid during peak hours. Tesla and other EV models come with touchscreen and smartphone charge scheduling. The owners can just plug in the vehicle after parking and the charging starts at the pre-set time. Scheduling electric cars recharging for the period of non-peak demand, a principle called valley filling, can save utilities millions of dollars by reducing their dependence on costly peaking plants, which are left standby and only run when the demand is high. The valley filling approach would have to rely on the smart grid. Automatic Metering Infrastructure (AMI) would measure electric usage in real-time and communicate this to the utility via radio frequency or broadband over power line technology. However, the valley filling approach is not free from problems. In the regions where such tariffs are in place, drivers often set their vehicles to start charging exactly when the off-peak rates kick in, resulting in strong hikes in the local power consumption. The central generation plants are just fine, but again, the local transformers suffer the most from this sudden extra demand. Moreover, shifting charging from day to night will not solve the problem. This is because the transformers are often designed to cool off at night. Depriving them the time to cool may lead to local blackouts, as the sustained excess current will eventually cook transformers’ copper windings. 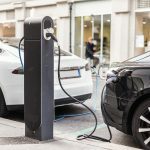 Utilities are challenged to find a way to distribute charging events across the full span of the off-peak period, or even better – to encourage electric car owners to charge at the times when the levels of renewable energy production are high: in mid-day for solar and midnight for wind. How could this be achieved? Managed charging can be the answer. Managed charging, also known as smart or intelligent charging, entails a combination of infrastructure and communication signals sent directly to a vehicle or via a charger to influence the driver’s decision on when to charge the car. Currently, the technology is in the state of field-testing, but already 69% of utilities in the United States consider implementing it, according to the Small Electric Power Alliance 2017 survey data. San Diego Gas & Electric is among the early adopters. The company’s pilot program features special rates encouraging electric car drivers to charge their vehicles when the electricity supply is abundant and the prices low. Through a mobile phone app, the drivers are informed a day ahead of the changing price of energy throughout the day. This not only makes it cheaper for drivers, but, by also minimizing on-peak charging, they maximize the use of renewable energy and reduce the need for new fossil fuel-powered plants and other electric infrastructure, the company explains. Southern California Edison implemented a workplace managed charging pilot project to investigate driver behaviour and responsiveness to pricing signals. The program included three pricing levels: the high rate provided drivers with undisrupted charging; the medium price imposed a peak demand restriction to switch from a faster (Level 2) to a slower (Level 1) charging mode, while the lowest price allowed drivers to be totally restricted from charging during a demand event. A similar pilot program was conducted by Pepco. These test projects have uncovered some technical bottlenecks for utilities looking at managed charging. In the Pepco’s case, the ongoing cost of the communication links was too high to make the project viable. Finding a less expensive, yet reliable way to send communication signals would be a key enabler to wider technology take-up. Another issue is the large number of open and proprietary protocols deployed by different vehicle and charging equipment manufacturers. Deciding on a single uniform messaging protocol would facilitate the roll-out. Plug-in electric vehicles are typically associated with taking energy from the grid, but it is also possible for an electric car to operate in a discharge mode, in which it acts as a giant battery and injects the power back into the grid. This ability, referred to as Vehicle-to-Grid (V2G), has been recognized as one of the most promising prospects the electric vehicles revolution can bring. The opportunities are numerous. With dynamic pricing system in place, PEV owners can make a profit by charging cars when the demand is low (and the energy is cheap) and sell it to the grid when the request for power spikes, for example, during heat waves, saving the grid from the overload. Electric vehicles can also enhance grid’s stability when it is subjected to significant disturbances, such as generator and branch tripping, bus faults, or sudden large load changes. Firstly, they can minimize the speed and voltage fluctuation by up to 80% and secondly, they can extend critical clearing times by 20-40%. As distributed energy storage, PEVs can also act as a backup power for renewable energy sources. Taking into account the growing role of renewables in the total energy mix, this chance must not be overlooked. Another possibility for PEVs is to store the excess power capacity from large utility scale wind power plants during the night and then release it to the grid during the day. Shifting EV loads to off-peak hours can mitigate increases in peak demand and ease the short-term impacts of EV adoption. But even with the problem of local clustering mitigated, there are still long-term challenges lying ahead. The growing number of plug-in cars will eventually drive peak demand higher, which, in turn, might compromise the overall reliability of the grid. Insufficient generation and transmission, commonly referred to as blackouts and rolling brownouts, can be felt immediately throughout the system. The grid must be capable of delivering the power necessary to charge electric cars, even on the most congested days. Because of that, the peak capability serves as the limiting factor for EV adoption under the current grid constraints. Moreover, even without increasing peak demand, the amplified level of transmission utilization can affect the cost of electricity delivery. The costs of congestion in transmission lines are already high and will likely grow even further as EV adoption increases. Electric vehicles present unique challenges and opportunities for electrical utilities world wide. The technological shift from fuel to electricity requires an increase in electrical production. While increased production is manageable for the grid on a large scale, localized problems will arise. Clustered charging, when multiple electric vehicles charge in the same area, is a risk to local infrastructure. Ways of managing local load such as building infrastructure and static price signals will prove to be less effective than before. The dynamic nature of shifting load as a result of vehicle charging is more challenging to predict and manage. Electric utilities need new solutions to mitigate the risk to infrastructure. Handled correctly, electric vehicles offer new, beneficial possibilities for electric utilities. Dynamic price signals and smart charging technology can help avoid building more infrastructure. The grid of tomorrow can be one which rewards beneficial charging behavior and driver input to manage load distribution. Scalable smart-charging has proven more successful at walking the tight-rope between the needs of utilities and it’s users. This at a fraction of the cost compared to previous methods of managing localized grid load. FleetCarma supports the adoption of electric vehicles by providing the technology and services required to evaluate the feasibility, plan for the adoption, and support the operation of electric vehicles. Fleetcarma offers solutions which include the SmartCharge Manager, SmartCharge Rewards, and Electric Vehicle Research Studies.